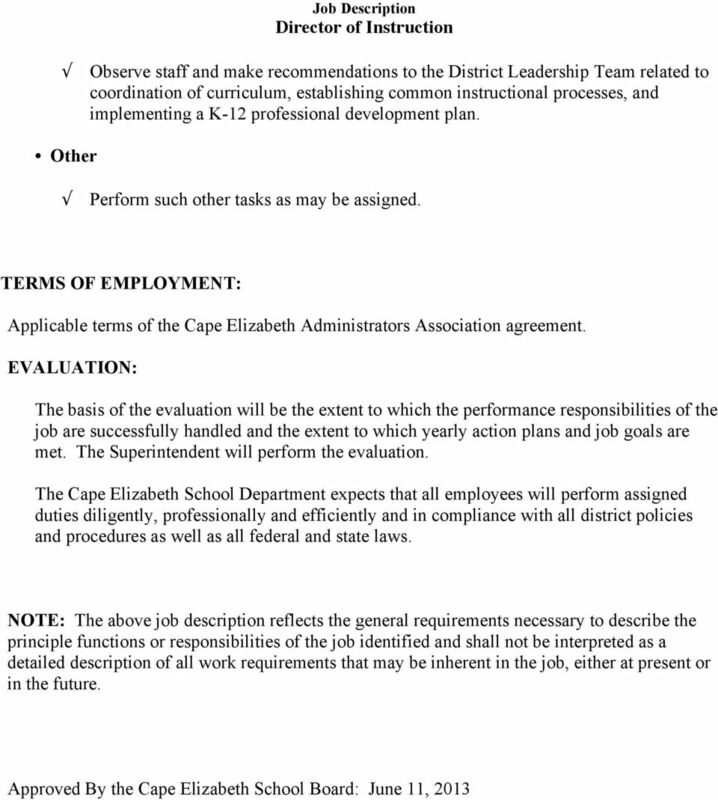 Download "CAPE ELIZABETH SCHOOL DEPARTMENT. Job Description. 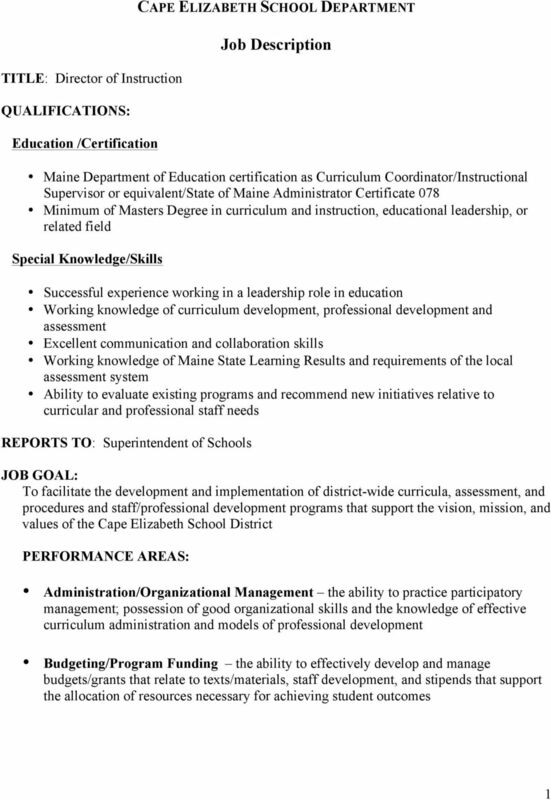 TITLE: Director of Instruction QUALIFICATIONS: Education /Certification"
3 Oversee the district's coordination of curriculum, instruction and assessment; make recommendations when building principals or School Board authorization is needed. Provide leadership and coordination in collecting and using assessment data to improve student learning. 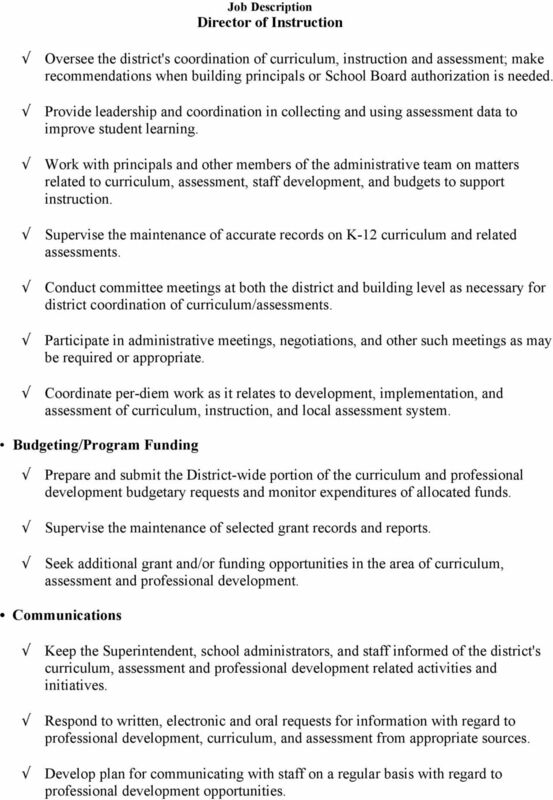 Work with principals and other members of the administrative team on matters related to curriculum, assessment, staff development, and budgets to support instruction. Supervise the maintenance of accurate records on K-12 curriculum and related assessments. Conduct committee meetings at both the district and building level as necessary for district coordination of curriculum/assessments. Participate in administrative meetings, negotiations, and other such meetings as may be required or appropriate. 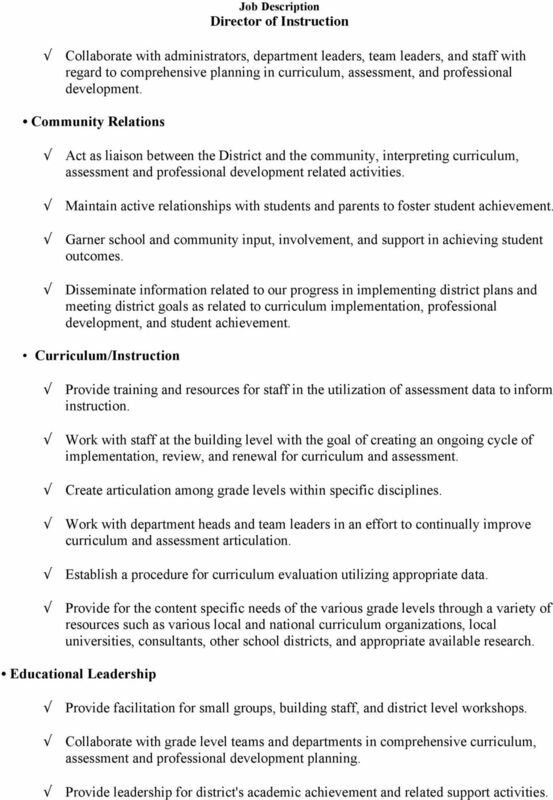 Coordinate per-diem work as it relates to development, implementation, and assessment of curriculum, instruction, and local assessment system. Budgeting/Program Funding Prepare and submit the District-wide portion of the curriculum and professional development budgetary requests and monitor expenditures of allocated funds. Supervise the maintenance of selected grant records and reports. Seek additional grant and/or funding opportunities in the area of curriculum, assessment and professional development. Communications Keep the Superintendent, school administrators, and staff informed of the district's curriculum, assessment and professional development related activities and initiatives. Respond to written, electronic and oral requests for information with regard to professional development, curriculum, and assessment from appropriate sources. Develop plan for communicating with staff on a regular basis with regard to professional development opportunities. 4 Collaborate with administrators, department leaders, team leaders, and staff with regard to comprehensive planning in curriculum, assessment, and professional development. Community Relations Act as liaison between the District and the community, interpreting curriculum, assessment and professional development related activities. Maintain active relationships with students and parents to foster student achievement. Garner school and community input, involvement, and support in achieving student outcomes. Disseminate information related to our progress in implementing district plans and meeting district goals as related to curriculum implementation, professional development, and student achievement. Curriculum/Instruction Provide training and resources for staff in the utilization of assessment data to inform instruction. Work with staff at the building level with the goal of creating an ongoing cycle of implementation, review, and renewal for curriculum and assessment. Create articulation among grade levels within specific disciplines. Work with department heads and team leaders in an effort to continually improve curriculum and assessment articulation. Establish a procedure for curriculum evaluation utilizing appropriate data. Provide for the content specific needs of the various grade levels through a variety of resources such as various local and national curriculum organizations, local universities, consultants, other school districts, and appropriate available research. Educational Leadership Provide facilitation for small groups, building staff, and district level workshops. Collaborate with grade level teams and departments in comprehensive curriculum, assessment and professional development planning. Provide leadership for district's academic achievement and related support activities. 5 Execute strategies to increase academic achievement and positive school climates. 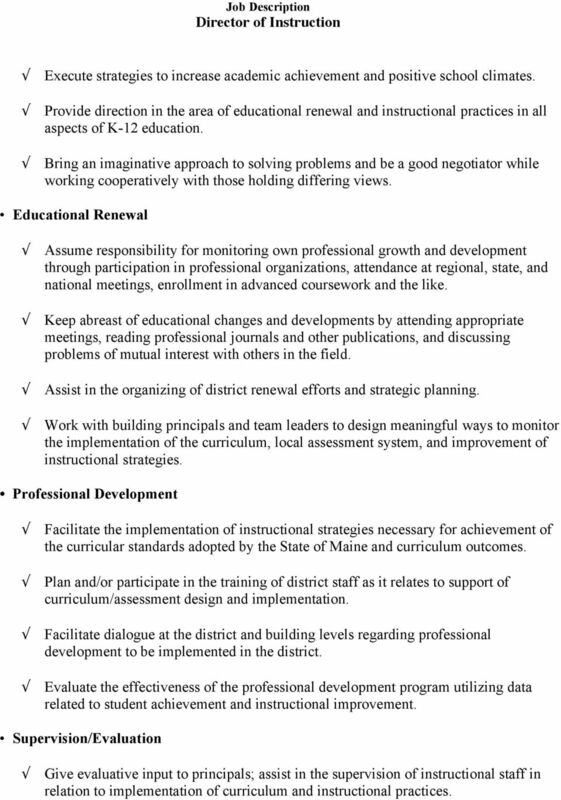 Provide direction in the area of educational renewal and instructional practices in all aspects of K-12 education. Bring an imaginative approach to solving problems and be a good negotiator while working cooperatively with those holding differing views. Educational Renewal Assume responsibility for monitoring own professional growth and development through participation in professional organizations, attendance at regional, state, and national meetings, enrollment in advanced coursework and the like. Keep abreast of educational changes and developments by attending appropriate meetings, reading professional journals and other publications, and discussing problems of mutual interest with others in the field. Assist in the organizing of district renewal efforts and strategic planning. Work with building principals and team leaders to design meaningful ways to monitor the implementation of the curriculum, local assessment system, and improvement of instructional strategies. 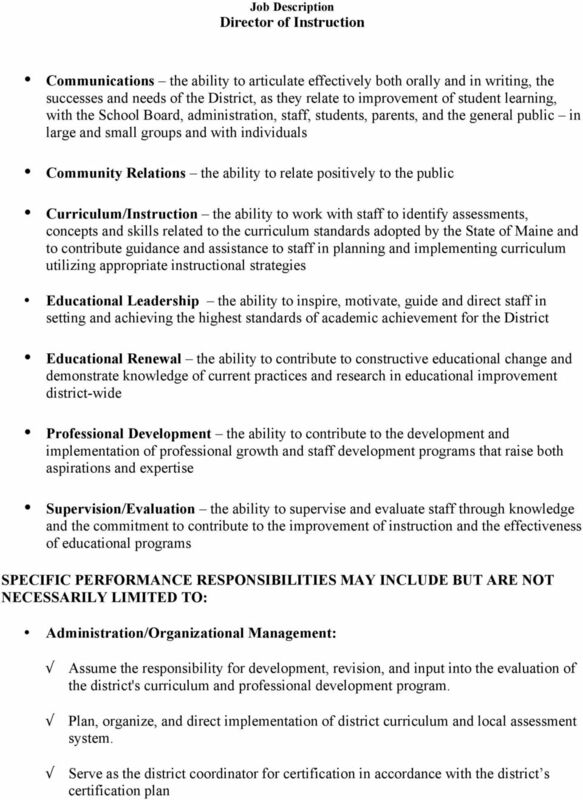 Professional Development Facilitate the implementation of instructional strategies necessary for achievement of the curricular standards adopted by the State of Maine and curriculum outcomes. Plan and/or participate in the training of district staff as it relates to support of curriculum/assessment design and implementation. Facilitate dialogue at the district and building levels regarding professional development to be implemented in the district. Evaluate the effectiveness of the professional development program utilizing data related to student achievement and instructional improvement. Supervision/Evaluation Give evaluative input to principals; assist in the supervision of instructional staff in relation to implementation of curriculum and instructional practices.